Here’s a feature from Wired about the process for training B787 pilots. Note especially the progression from PC-based training in cubicles to the use of full flight simulators. It’s a point I often make when discussing the use of PC-based simulations like Microsoft Flight Simulator and X-Plane in general-avaition flight training—and one of the core arguments in my forthcoming book, Scenario-Based Training with X-Plane and Microsoft Flight Simulator. Regardless of what the regulations and advisory circulars say about flight training devices, many people obsess about flight models, physical switches and controls, and absolute fidelity when representing instrument panels. In doing so, they miss most of the value of integrating PC-based simulations in flight training. The Canadian magazine Macleans included this feature about cockpit automation in its August 2011 issue. It focuses on airliner operations, but much of what is said applies to the increasingly sophisticated cockpits of small, general aviation aircraft. Transport Canada, the agency that regulates aviation in Canada, released a report and analysis of stall/spin accidents in 1999. Here’s a link to the PDF at Rich Stowell’s website. It’s sad to see that 12 years later, most of its analysis still rings true. Previously, O69 had a VOR RWY 29 approach off SGD with an MDA of 1260 (1174) and 1-1/4 sm required visibility. The old GPS approach to the same runway offered an MDA of 900 (813) and 1 sm visiblity. And that GPS approach (now NA) had a 22-degree dogleg at the FAF. The new approach is a significant improvement that shows the value of WAAS-based procedures, even to a 3600-ft runway, and it allows you to file O69 as an alternate if you have WAAS. N.B. that the VOR RWY 29 procedure, updated for a new airport elevation, etc., still has a note that requires using the Santa Rosa altimeter setting, otherwise, the approach is NA. But the RNAV RWY 29 approach takes advantage of the on-field AWOS, and local weather is required for filing O69 as an alternate. I’m betting someone at FAA neglected to remove the Santa Rosa altimeter requirement for the VOR approach. *The airport has an AWOS-3PT (AWOS-3PT contains all the AWOS-3 sensors, plus a precipitation identification sensor and thunderstorm detector). Phone: 707-773-1529. **The new RNAV approach includes LNAV/VNAV mins–484 (707) and 1-3/8 sm–but if you’re using WAAS and the satellite configuration is good enough for vertical guidance, you’ll almost certainly see LPV annunciated, not LNAV/VNAV. Wiley has announced my new book about using PC-based flight simulations to complement flight training. 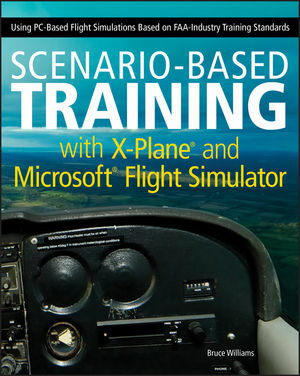 Scenario-Based Training with X-Plane and Microsoft Flight Simulator: Using PC-Based Flight Simulations based on FAA and Industry Training Standards will be out in January 2012. The title offers general guidance about using PC-based simulations effectively, plus reviews of the essential features of X-Plane and FSX. It includes links to sets of Situations (for X-Plane) and Flights (for FSX) that correspond to lessons based on the private pilot and instrument rating syllabi available at the FITS website. Each lesson in the book includes specific references to key FAA training handbooks and related background information. The book also helps virtual aviators–flight simulation enthusiasts–master essential skills so that they can expand and increase enjoyment of their hobby.